It is said that “manners make a man” – meaning that proper decorum and conduct are what make’s a human being what he is. This is certainly the case with believers. The Messenger of Allah, Allah bless him and give him peace, told us that through good character alone, a person could reach the station of those who pray and fast constantly. Shaykh Faraz Rabbani beautifully clarifies the most common elements of proper Islamic decorum in this essential course for those who seek a shortcut to closeness to Allah and His Messenger. The Messenger of Allah, Allah bless him and give him peace, said that he was sent to complete good character (Muwattaʾ Malik), which leads us to understand that sound religious practice results in good character. However, there are certain matters of conduct which one must learn from those who have them. Among such individuals was the great scholar, Shaykh Abdul-Fattah Abu Ghudda, who, after a life of learning, teaching and benefiting others, died in 1997. Amongst his works is his great book, Islamic Manners, in which he beautifully detailed much of the conduct believers need for gracious day to day dealings. 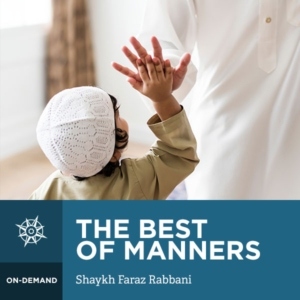 Join Shaykh Faraz Rabbani as he unpacks this excellent book, delivering crucial guidance on matters ranging from cleanliness, visiting people, dealing with non-Muslims, to death and condolences.